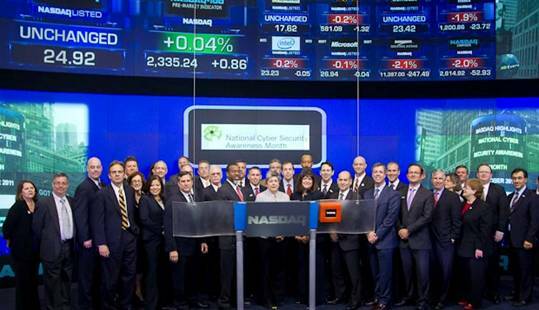 Yesterday morning as part of National Cyber Security Awareness Month, I had the privilege to attend a breakfast and NASDAQ bell ringing ceremony with Secretary of Homeland Security Janet Napolitano at the NASDAQ Market Site in Times Square, New York City. The morning included a roundtable with participants from law enforcement, the government and the private sector discussing ways to fight cyber crime, and emphasized the Department of Homeland Security’s (DHS) commitment to forge partnerships in order to create a safe, secure, and resilient cyber environment. I very much enjoyed the opportunity to discuss the current state of cyber security with so many leaders from both the private and public sectors. Secretary Napolitano explained that the private and public sector must work together to ensure greater awareness of the issue of cyber security, improved sharing of information, and a more coordinated response to cyber security incidents. Malicious actors are working to steal money, intellectual property, personal identity information, as well as disrupt our economy. She explained how DHS is working to improve the state of cyber security. The take-home message is clear: Security awareness is the key to preventing cyber attacks, and private industry and government must work closely together to improve our ability to safeguard intellectual property and ensure our continued economic prosperity. The theme of National Cyber Security Awareness month is STOP. THINK. CONNECT. When you cross the street, you look both ways so make sure it’s safe. Staying safe on the Internet is similar. It takes some common sense steps — STOP. THINK. CONNECT. THINK. Take a moment to be certain the path ahead is clear. Watch for warning signs and consider how your actions online could impact your safety, or your family’s. STOP. THINK. CONNECT. Protect yourself and help keep the web a safer place for everyone. Qualys has been working for the last 10 years to help customers identify and remediate potential vulnerabilities to secure and protect information and IT assets. We feel strongly that industry and government collaboration is needed to effectively fight cyber-crime; after all, attackers share information, so we need to share information to best protect ourselves. This event along with this month’s activities for National Cyber Security Awareness Month, are steps in the right direction, and we look forward to increased collaboration and sharing of information to fight cyber crime.